IRIS is a simple, award-winning technology designed to prevent mistaken-for-game hunting accidents. The IRIS sensor warns a hunter if they mistakenly target the person they’re hunting with, or anyone else wearing IRIS-detectable gear. 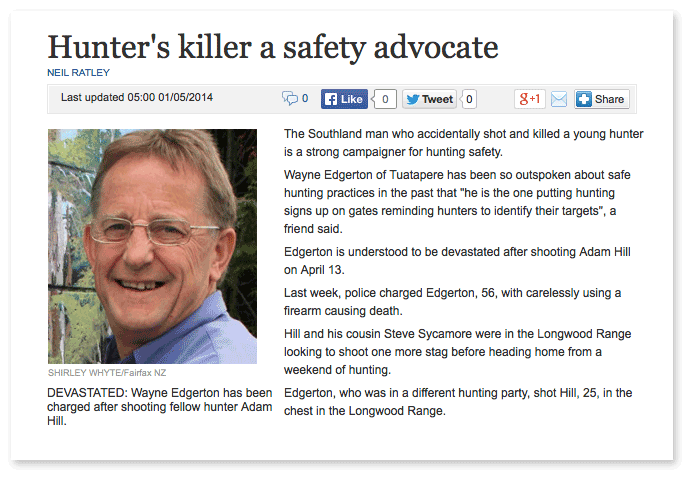 In New Zealand, 80% of mistaken-for-game hunting accident victims are shot by someone from their own hunting party. What’s more, many victims are wearing blaze-orange when they’re shot. No-one thinks it would happen to then, but it happens every year, even to very experienced, responsible hunters. "Very compact and beautifully made... in the field the IRIS system worked very well and did exactly what it was designed to do." "The IRIS system works beautifully and does exactly what it is designed to do in a very simple, lightweight and straightforward way that is a credit to its designers." "Since the tragic death of a really close mate I have been using the IRIS system on all my hunts. For me using the IRIS is another layer of safety and a step towards stopping these deaths." "As the different blaze options aren’t stopping the accidents, I decided on the IRIS system from Hunter Safety Lab to pay my friends and family the respect they deserve...When my sons bring a friend along, their mum knows the importance of safety on the trip." "I have a child that has been mentor hunting ever since the program came out... I know how excited the kids get, and I would definitely buy one for him and myself." "I think this is a fantastic idea, and would not hesitate to purchase this device for my own protection, and for the safety and protection of those around me when I am hunting. I would also consider buying this as a gift for family and friends who are hunters." "I hunt in large groups participating in drives, and this is a concern of mine especially knowing there are unexperienced hunters involved! Thank you for taking steps toward making our sport safer!!!" "As a father of four I think this is a great idea and will go far as a hunter safety and education tool. I can tell you that I am excited for this technology. My sons that hunt are 14 and 13 years old. This technology would definitely put me a little more at ease." "Is working brilliantly in the fog, snow and freezing weather down here. Can’t say the same for my fingers or aim! ... It’s such a great product." "5 star excellent concept & product. I was a skeptic at first but when I saw the demonstration I was sold. IRIS will save lives." "Hi, I am truly impressed with your product and I believe it is perfect for the New Zealand hunter... it is cheap at twice the price in terms of how much value you put on a life." "I’m a Hunter Safety Instructor for New York State. The whole package is the best thing I’ve seen in a long time. I know there is some hunters in my area that wish they had something like this." Why do respected, experienced hunters sometimes make fatal mistakes? Learn how heuristics and cognitive bias can cause any hunter to make a fatal error. 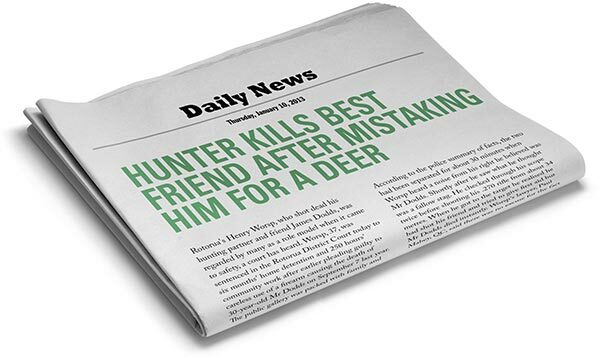 Download the research report “Mistaken-for-game hunting accidents-a human factors review” (PDF 0.9mb) to find out why many mistaken-for-game hunting accidents aren’t about negligence, they’re about basic human error. Over the past decade, the steady improvement in hunting accident statistics has flat-lined. 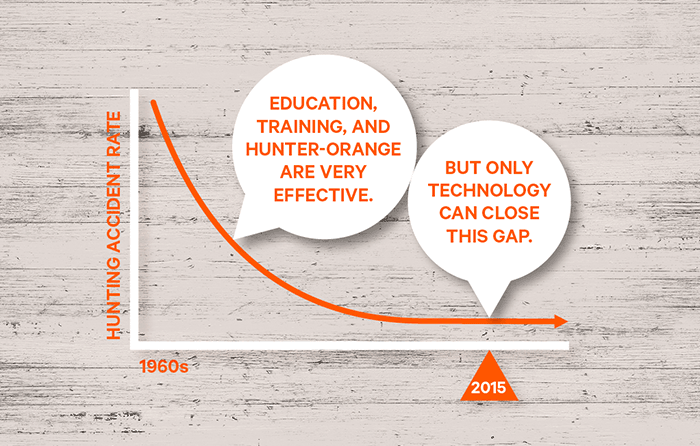 This indicates that although hunter-education and hunter-orange are doing a great job at keeping the accident rate down, they have reached the limits of their effectiveness. In spite of best intentions, the reality is that people make mistakes, and these mistakes sometimes have tragic consequences.